Prime Minister, police commander commend quick-thinking passerby who shot attacker; police urge members of the public to remain vigilant. The off-duty security guard who intervened to stop Wednesday afternoon's terrorist attack in Mishor Adumim, close to Jerusalem, has been praised by police and Prime Minister Binyamin Netanyahu for his heroic actions. 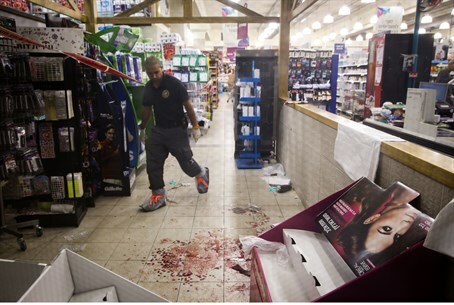 Late this afternoon two people were moderately wounded by a knife-wielding Palestinian terrorist at a branch of the Rami-Levy superstore in Mishor Adumim, which abuts the Jerusalem suburb of Maalei Adumim. The man, who is employed as a guard at the prime minister's office, used his licensed firearm to shoot and injure the attacker, enabling security guards to subdue him and hand him over to police. In a statement, Netanyahu hailed the quick-thinking citizen. "You performed an important act, and prevented a larger terror attack," the PM said. "Even when you are not on duty you are on duty. Well done." Judea-Samaria region police commander Nitzav Kobi Cohen also praised the as-yet unidentified hero, agreeing he almost certainly prevented a far more serious outcome, as well as the quick response of police to the incident. Cohen pledged to increase the police presence in public areas following the attack. In addition, police have urged members of the public to be vigilant and report any suspicious persons or items to police using the emergency 100 hotline. Police spokeswoman Luba Samri said in a statement roughly two hours after the stabbing that the attacker was a 16-year-old from the Arab village of Al-Azariya, east of Jerusalem. Two additional suspects have now been arrested as well, including one worker at the store, with eyewitnesses saying that the Israel Security Agency (ISA) is interrogating them at the scene. It remains unclear whether they were involved.